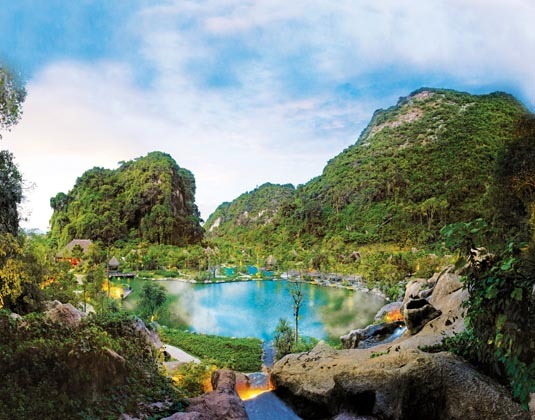 Capital of the state of Perak on the west coast of Peninsula Malaysia, Ipoh is surrounded by a scenic landscape of limestone outcrops with wonderful cave temples, verdant rainforest and cascading waterfalls. Once the centre of the world’s tin industry, Ipoh is now well known for its excellent restaurants, hawkers and local dishes; while architecturally the town is characterised by colonial era Chinese shop houses and several impressive historical buildings from the British colonial era, such as the Railway Station, Town Hall and Court House. It is however the chance to escape the stresses of life and luxuriate in rejuvenating therapies which brings many visitors to this region. The Banjaran Hotsprings Retreat is a sanctuary of bespoke holistic wellness offering treatments from the ancient ethnic traditions of indigenous Malay, Chinese and Indian cultures. Blessed by nature, The Banjaran offers the ultimate spa experience as well as gourmet-style dining with locally-sourced ingredients, and activities including trekking.